I had the requirement to upgrade the virtual hardware of a large number of VMs to the latest available version. The following PowerCLI script schedules an upgrade of the vHW listed in a .txt file. If you take a look at the vSphere Webclient you can find a schedule for the VM compatibility upgrade. It will take place during the next reboot of the VM. What happened to Update Manager? It used to have a feature where you could set that in vCenter. Has that feature been removed? 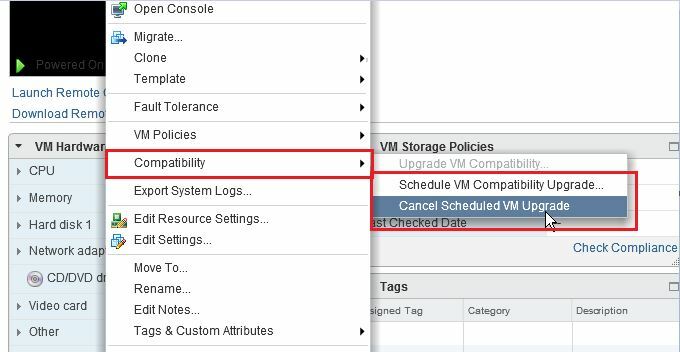 is there a difference between this and Update Manager feature in vCenter. The property ‘ScheduledHardwareUpgradeInfo’ cannot be found on this object. Verify that the property exists and can be set.